Consumer Behaviour has always fascinated marketers all over the world. Rightly so, because it offers interesting insights into the working of the human mind in making purchasing decisions. For instance, why do consumers repeatedly purchase a particular brand or, in some cases, why do they switch from one product to another? 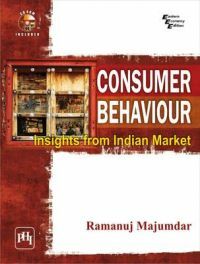 In this compact, concise and profusely illustrated text, Professor Majumdar, with his rich and varied experience in Marketing, tries to provide interesting insights into some of these and other interesting questions about consumer behaviour. He gives a masterly analysis of the theory and practice of consumer behaviour and decision making and the factors that influence it. Divided into six parts, Part I of the text shows the importance of understanding consumer behaviour; Part II highlights different aspects of consumer psychology and covers such topics as consumer motivation, consumer perception, and consumer personality. Part III demonstrates how consumers behave in their social and cultural settings, the effect of personal factors, and the influence of reference groups on consumer behaviour. Part IV dealing with consumer decision making describes the various stages involved in brand choice, the post-purchase behaviour and, importantly, the six well-established models proposed by scholars on consumer behaviour. Part V analyzes the diversity of the Indian market and about the emerging patterns of consumer behaviour. The concluding part--Part VI--gives seven live case studies that dwell on brand building and showcases some successful brands marketed in India. • The book is a harmonious blend of theory and practice. • Each chapter contains numerous examples of marketing practices in India. • Demonstrates the diversity of the Indian market. • Contains a CD with power point presentations (PPTs). For the wide spectrum of readers--the students of management, the marketers and the practising managers--reading this book should be a very valuable and rewarding experience. They would treasure the book for its incisive insights on the Indian market and the wealth of illustrative examples and concepts it offers. RAMANUJ MAJUMDAR, Fellow (PhD), Marketing, IIM Calcutta, is Professor of Marketing, Indian Institute of Management Calcutta. Over an academic career spanning 30 years, he has taught with distinction a number of marketing courses in PGP, MDP, and in-company programmes. Professor Majumdar has delivered invited lectures in leading business schools in USA, Germany, the Netherlands, and the UK. He has undertaken numerous consultancy projects in marketing for many blue chip companies and Public Sector Undertakings in India. Professor Majumdar has authored three books, all published by PHI Learning.